A brilliant post-war self-reflexive commentary on the Hollywood studio system. Go inside classic showbiz! Before the decentralization of “Hollywood” filmmaking, the big studio was king. And Hail, Caesar captures the socio-economic mountains and pitfalls of the decline of the Golden Age of Hollywood perfectly, complete with a pure message about love, dedication, and highbrow humor along the way. You couldn’t have asked for a better cast. From the excellent writing to the impeccable acting, this film is sure to provide you with old-school style entertainment paired with plenty of topics of discussion–especially for cinema scholars and historians like myself. Return to the Hollywood that still inspires dreamers today and experience life in the studio system. This is one of the best self-reflexive films about Hollywood itself since Singin’ in the Rain. Although, the social-commentary is more or less a plot device that plays in the background while the main plot is the true focus of this exceptional narrative. Truly a remarkable film that will likely find its way into sociology and film studies classes alike. Hail, Caesar takes place during the final days of filming of an adaptation of the story of the Christ. During a set break, Baird Whitlock (George Clooney) is drugged and kidnapped by a couple of extras and taken to a secluded beachside mansion in Malibu. Meanwhile, Eddie Mannix (Josh Brolin), head of physical production for Capital Pictures, is busy running the show–from personnel management to the shuffling around of actors. Early on, you learn that Mannix is being aggressively pursued by the Lockheed corporation and he must decide either to pursue a career that will allow him to be with his family more and retire early or remain in Tinseltown to head up production and develop motion pictures. Where to begin?!? As a peer-reviewed published cinema [and themed entertainment] scholar and historian, there are are so many different ways of applying a critical analysis to this film. Leaving the cinema last night, I was perplexed as to how to write about it. Ordinarily, I have a general idea of the direction I will head in my review by the time the credits roll–not this time. There is definitely a subplot in the movie that would be great material to dissect and analyze but I don’t want to spoil that for you; although, I can say that is is very apropos for that period in 1940s/50s Hollywood. In order to analyze the material that I found most interesting, I want to first spend a moment on the film itself. Even before watching it, you already know that it boasts a brilliant cast and thankfully everyone lives up to the expectation that comes with their respective talent. From the leading players down to the A list cameo appearances, all the actors bring a unique flavor to the overall recipe of the movie. One of the elements that stands out the most is the attention to detail in the classic Hollywood production design. Essentially, we are watching a movie containing the making of another movie. 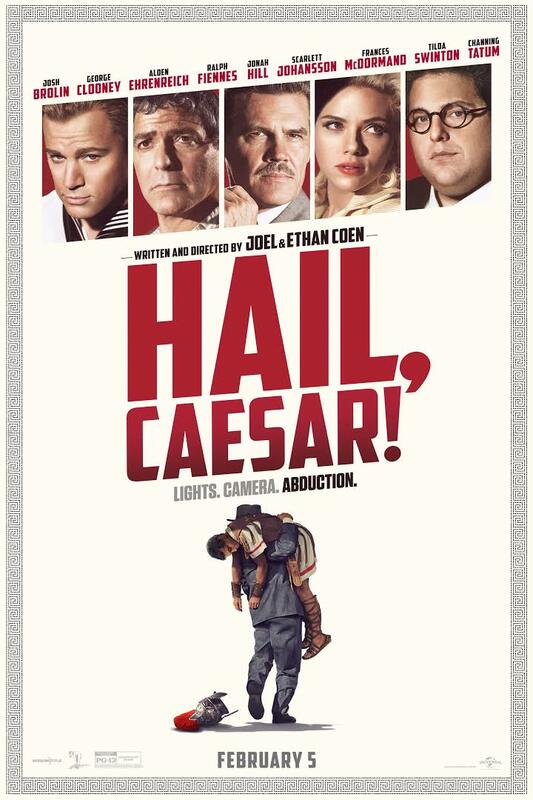 The matte backdrops and traditional rear projection doesn’t stop in the story of the film being made in Hail, Caesar, but the classic production styles and designs cross over into the production of the Hail, Caesar itself. From the color schemes to the wardrobe and makeup, the attention to detail is flawless. Although much more humorous and satirical than the epitome of self-reflexive post-war Hollywood films, Billy Wilder’s Sunset Boulevard, Hail, Caesar does a superb job of going inside the word of showbiz and highlighting positive and negative consequences of the former studio system. The film opens up with Mannix pulling Gloria DeLamour (Natasha Bassett) from an unauthorized photoshoot because the image the studio has of her could be tainted. That is really the first glimpse into what life was like for stars who worked in the Hollywood Studio System. Not limited to the talent, Mannix even told directors who would star in the pictures that they were hired to direct. Capital Pictures pulled a cowboy off his motion picture to then star in a drawing room comedy. When you worked for the studio, you worked FOR the studio. From your image to the projects you worked on (whether talent or technical crew), your every move was managed by the studio heads. Sounds like the perfect setup for exploitation, doesn’t it? In many ways, yes. However, the studio system also provided a central hub for working in motion pictures. One of the scenes shows Mannix walking down a corridor of editing offices, and that is something that isn’t quite the same today. Studios had exponentially more full-time staff until the final collapse of the studio system in the late 1950s/early 1960s. You had a regular job Monday-Friday and were typically on a salary. You were provided meals and other amenities during the work day. Yes, many aspects of your career were managed–even down to who accompanied you to the premiere of the film you either worked or starred in. But, many more people were employed by the studio directly than today. Just something to think about. The studio is aptly named Capital Pictures. And rightly so, because at the heart of the movie, the two-fold plot of the film contains socio-economic commentary. The counterpart to the socio-economic side is about being dedicated to one’s true passions. Mannix can easily represent anyone who has a job that they work hard at and are dedicated to but often drawn to opportunities that would be easier and make more money. Do you choose to follow your passion? Or, do you choose the easy way out that would be more profitable? You will have to see the movie in order to discover how Mannix dealt with that real-world conundrum. Although the story of the passion of Christ is a backdrop in the film, it actually plays quite an important role near the end of the third act. The message of love transcends the screenplay (being shot in the movie) and impacts the actors and studio leadership. There are so many wonderful elements to discuss in Hail, Caesar and I have just touched on a few of them. I encourage you to make your way to the cinema this weekend in order to experience it for yourself. Great blog, nicely written! I hope I’ll get the opportunity to see it soon. I’d been in two minds about this film, but it sounds great. Thanks for the recommendation, great review.